With the circus that is the World Superbike Championship wrapping up for the weekend at the Imola circuit, Ducati asked a few select journalists to stay behind. After a superlative-laden speech by Ducati supremo Claudio Domenicali, they hit the track on the brand new 2016 Ducati Panigale R. To say that they were gobsmacked would be a gross understatement. “That’s when the trigger was pulled in my head,” says Andy. It just so happens that Parts World is Switzerland’s premier aftermarket distributor and to make this insanity happen, they joined forces with Ducati Zentralschweiz, Schaub Metalworks and exhaust giant Akrapovi? to form the ultimate dream team. Instantly they were struck with the first challenge of the build, and clearly one that had deterred others from ever getting past this stage. There were wires everywhere, something that shouldn’t surprise given the technological power house that the Panigale is. So hours were spent hiding and re-routing the wiring for the ride-by-wire, ABS, wheelie control, data analyzer, espresso machine and a host of other units including the brains of the operation, the mighty Bosch IMU. The contrast between his methods and the technology overload of the stock bike could not be more stark. Raphael works metal by hand. There’s no 3D printer or fancy CAD modeling here. Offering up pieces of two mm aluminum sheet, he simply visualises the components and forges them by hand. The first of these incredible parts is the gas tank that had to be silky smooth café racer on the outside and complex mix of angles and parts to work with the EFI on the inside. 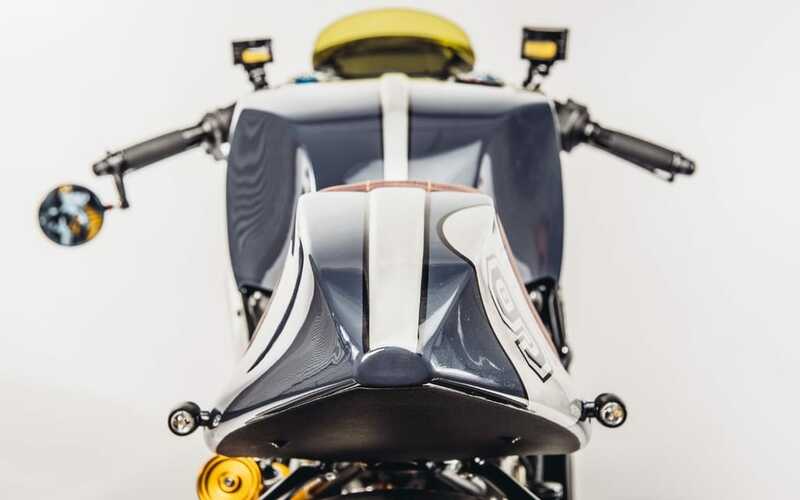 The single seat with a vintage-style café hump follows the kicked-up tail lines of the modern Duke, while still creating a seamless transition with the new tank. To further enhance the look and add to the bike’s muscular shoulders, Schaub crafted some extra gill-like side vents that merge perfectly with the tank. Mounted below the headlight, the shark mouth-like opening actively forces air into the airbox to assist in plenum pressurization. It looks incredible. 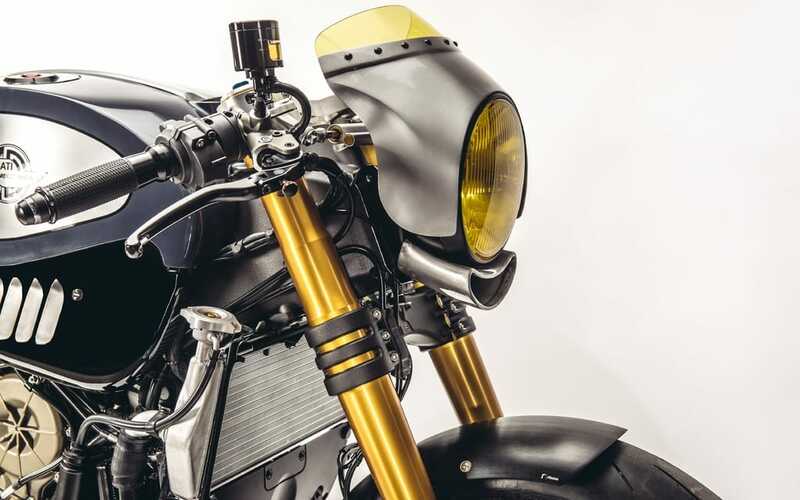 Above, the twin headlights are gone, replaced with a traditional unit that now wears an alloy fairing and a beautifully frenched-in yellow screen with some industrial-style fittings for more of the old-school look. With the bodywork complete, Andy had a serious struggle on his hands; how to convince his partners to go with the unusual colour he had in mind. But with a good friend close by at Burkhardts paint, everyone agreed to let the master panel and paint man do his job. Now, the colour combination couldn’t be further from the factory Ducati red, but it perfectly shows off the incredible lines of the Schaub alloy pieces. 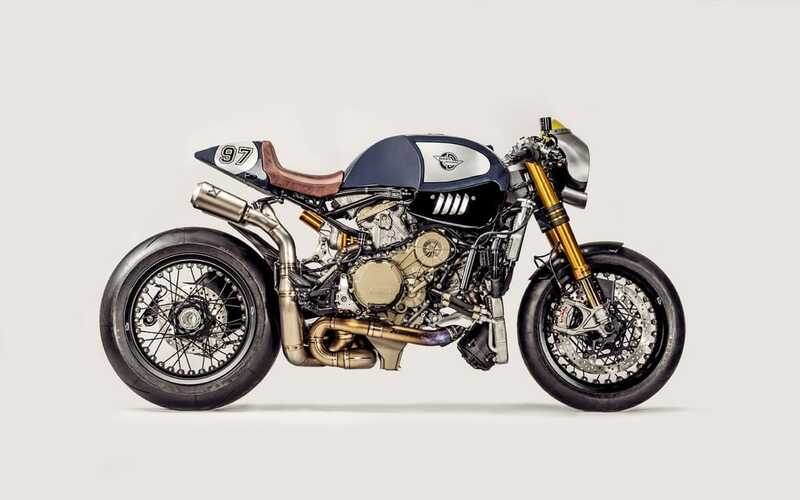 The vintage blue with black accents give the whole bike an “anything but Italian” feel with the raw metal allowing the yellow of the lights and the gold Öhlins suspension to pop in all the right places. Finally, the job was completed with a hand-stitched leather seat, the hue of which was chosen for its ability to accentuate the dominant blue hue. Of course, powering the project is the incredible Ducati L-twin 205 hp engine as used in the factory’s own WSBK efforts. In fact, it’s hard to think of any café racer in existence capable of getting you to your favourite watering hole as fast as this one. The internals are precision perfect, titanium is used for the rods and the valves, while the crankshaft is tungsten-balanced. But what really captures your attention is that exhaust. With Parts World the official Akrapovi? distributor for Switzerland, they managed to source direct factory help for the pipes. So impressed by the potential the Blue Shark design possessed, the boffins at the “Big A” wanted to help to adapt a genuine WSBK set-up. 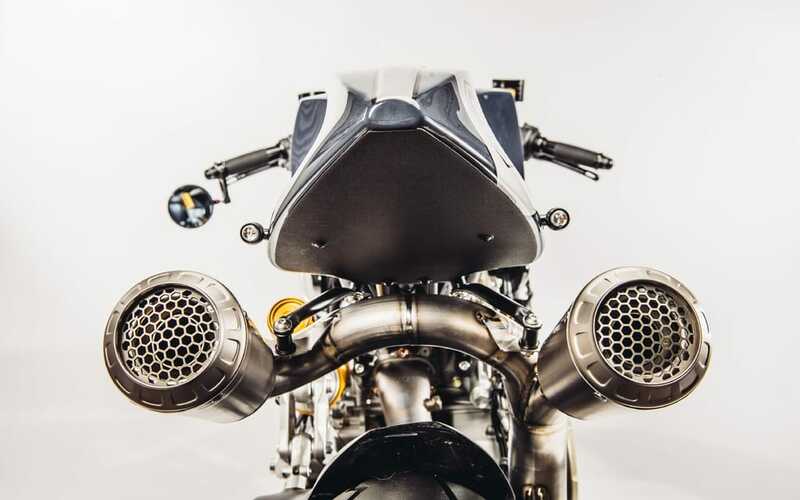 The titanium system, nicknamed the “Shotgun,” was requested by factory Ducati rider Chaz Davies who felt the 200+ hp engine needed a little more power. It turned his season around, and it adds an orchestral soundtrack and visual appeal unlike any other exhaust system on the market. With the quick shifter on board, the twin cans provide the perfect barrels for launching impressive sets of flames out the bike’s tail. With Parts World being the distributor for major brands like Rizoma and Kineo, it made perfect sense to show off their wares. Rizoma comes to the party with their gorgeous fluid reservoirs mounted on the clip-ons. A set of their fully adjustable rear-sets makes it an absolute pleasure to punch through the gears. But if one addition was going to make or break the build, it was the wheels, and with Kineo on board, they made it in a big way. The single-sided swingarm really shows off the stunning spoked rims that are capable of working with the latest tire technology while giving the bike classic appeal.